The Evergreen Lodge fronts one of Tortuguero's canals and is the ideal location from which to explore this unique and magical area, surrounded by towering trees and exuberant vegetation. The lodge's secluded location allows guests to fully experience the magical sounds of nature all around. The owners have taken great care in providing guests with rooms that are absolutely charming and attention given to every little detail. The lodge has 26 comfortable and spacious rooms, with comfortable beds, private bathrooms, hot water, and ceiling fans. 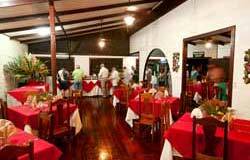 There is an excellent restaurant and bar onsite and they also offer bilingual guided tours of the area. A unique swimming pool surrounded by beautiful gardens lends a finishing touch to the amenities. The main dining room with soaring ceilings provides first class meals in an atmosphere that reflects and compliments the jungle paradise surrounding it. 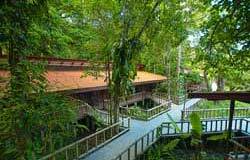 At Evergreen Lodge you will fully experience the tropical rain forest of Tortuguero. 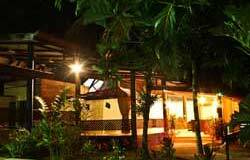 So come, relax, and enjoy the rich flora and fauna of the Costa Rican Amazon at Evergreen Lodge.